The Special Constabulary is a team of dedicated volunteers from the local community who provide tremendous help and support to regular police officers. #BeSpecial video featuring Libby Appleyard > click to play. #BeSpecial video featuring SC Scott Waring > click to play. #BeSpecial video featuring SC Ayman Al-Aride > click to play. Special Constable Ellie Goldsmith has been with Suffolk Special Constabulary since April 2015. Click here to read Ellie's Case Study. Special Inspector Jeremy Philpot has been part of Suffolk Special Constabulary since May 1996. Click here to read Jeremy's Case Study. Our Employer Supported Policing (ESP) scheme is an initiative that encourages businesses and police to work together to support their staff to become special constables. This national scheme is already proving successful bringing numerous benefits to employers, employees and the local community. Businesses on board in Suffolk are: BT/Open Reach, AXA, Willis, Forestry Commission, Waveney and Suffolk Coastal District Councils, Network Rail, Adnams and British Gas. How can my business support the scheme? We are keen to strengthen links and work in partnership with local businesses. Allowing employees flexibility to take time out of employment (paid or unpaid) to conduct duties. This could be achieved in a variety of ways but some employers are currently supporting with between 2 and 12 days a year. Putting up posters and stocking leaflets on volunteer recruitment. 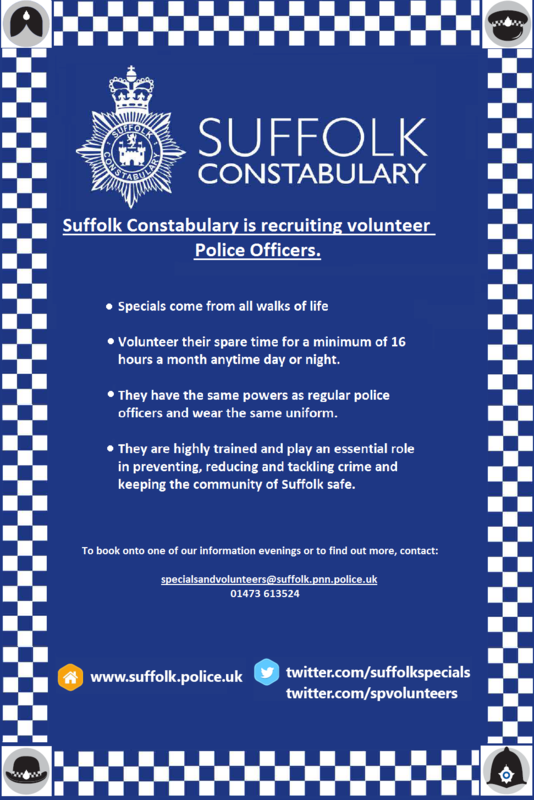 Allowing representatives from Suffolk Police to hold recruitment events in your premises. A citizen of: the European Economic Area (Austria, Belgium, Denmark, Finland, France, Germany, Greece, Iceland, Ireland, Italy, Lichtenstein, Luxembourg, Netherlands, Norway, Portugal, Spain, Sweden and the UK); the Commonwealth; the Irish Republic OR have the right of indefinite stay in the UK. Be able to pass the vetting criteria. There are no height restrictions but you do have to meet our vision standards. When you apply, you will receive a form that you will need to take to a qualified optician for completion and return. If you are employed in any occupation with client privilege or are a member of the medical and health professions, you may apply but your application will be have to meet both your employer's and the Chief Constable's approval. There are other employment restrictions. If you would like further information about the specials, please email: SpecialsandVolunteers@suffolk.pnn.police.uk or check out the College of Policing website. 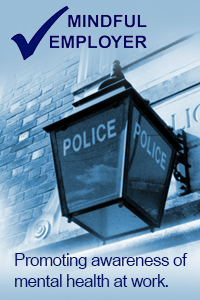 As a special constable you will work closely with regular officers in serving the community. This is a great opportunity for you to meet people from all walks of life and gain experience in wide range of policing duties. You will be presented with constant challenges and opportunities to develop your skills and you will also receive excellent training - both initially and during your first year of service. In your first year you will be given 14 core training sessions to help you work effectively and safely as a special constable. There will also be ongoing training available to you on new legislation, conflict management and other key skills, which will also support you in your full-time employment and personal development. If you volunteer as a special you receive no pay, as it is a voluntary service. However, you can claim mileage expenses or the cost of travel to and from duty. You can also claim out-of-pocket expenses and/or subsistence whilst on duty. You may also be entitled to a boot allowance if you serve a certain number of hours. If you lose work pay due to having to attend court to give evidence, we will reimburse you. Sickness benefits will also be paid to you if you are injured on duty. You will be provided with a free uniform that is virtually identical to that of a regular officer. Your uniform will remain the property of Suffolk Constabulary. We will also issue you with handcuffs, a baton, and CS spray after you have been trained in how to use this equipment and hold the necessary certificates. Speak to anyone serving as a special and they will tell you that they achieve a real sense of satisfaction from their work - particularly after an incident where their work has had an impact on people. They also find their confidence and self-esteem improves and that they find a great deal of pleasure and a sense of pride in helping others. The Special Constabulary is a voluntary body, whose officers form a vital part of the police family to assist their regular colleagues to police the communities of Suffolk. Specials come from all walks of life and are valued members of our organisation, who give up some of their spare time to help us keep the county safe. What does a special do? Specials perform a variety of police duties to support regular officers with the day-to-day policing of Suffolk. This could involve foot and vehicle patrols, being part of the immediate response team or assisting with police operations. As a special, no two shifts are ever the same - you could be dealing with road traffic collisions, public order, domestic disputes, missing persons or fires. You may also be asked to assist at large scale public events. These can range from village and town festivals and local sporting events to county shows and royal visits. You must complete at least 16 hours of service per month. Your hours will be flexible and you can arrange them according to your personal, home and work commitments. However, in an operational emergency, we may call you out for duty. The more hours you put in, the more you will get back and the quicker your confidence will grow. Many specials do far more than the minimum required and there is no restriction. We will, however, discourage you from letting your work as a special take over your life. You can expect to be based at the nearest police station to your home, but you may have to travel to another station for training.